We hope everyone’s new year is starting out great. With Valentine’s Day right around the corner, we wanted to remind everyone about our awesome couples nights! We do a fun thing here at the studio where couples paint one painting on 2 canvases (to be hung next to each other). It’s one of our favorite classes to do, such a fun way to connect creatively with your partner. You really have to work together and collaborate, it’s a really fun (and sometimes challenging *wink*) experience for couples! You can also do separate canvas paintings or even wine glasses which are a favorite as well. You will find such a relaxed atmosphere here at the studio, have a glass of wine (or a beer! ), bring food/snacks if you like, and enjoy an evening doing something new. Our instructors will lead you at your pace through the painting, giving you a couple of hours of quality creative time with your significant other. Change up the usual date night, even if you think you aren’t artistic or haven’t painted since kindergarten, you will be pleasantly surprised at how great your painting will turn out! We have a great time with couples classes, the dynamic is so fun and even the guys who were a bit reluctant almost always come around to really enjoying it as well! 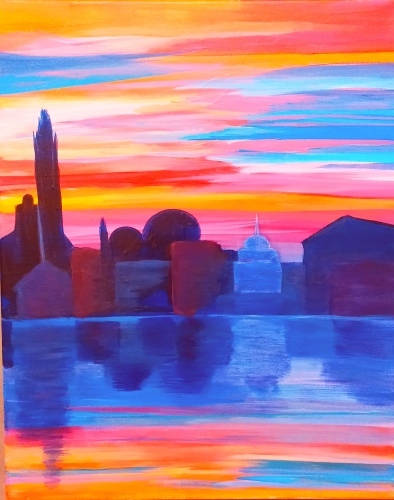 Check out the “classes” tab on our website for a painting that you love and sign up for a class today! Happy Valentines Day and we hope to see you in the studio soon!